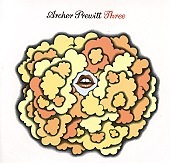 Archer Prewitt's latest solo outing, the appropriately titled Three (his third full-length), is an AM pop masterpiece, sounding at home on the AM radio of the 60's, with its jangly pop and sunshine melodies. Bright and poppy, the album is not without its rock teeth though, because it can bite down hard when it needs to, sprinkling danceable rock 'n' roll in with the sparkling hooks. "Tear Me All Away" is pushed to the limits with a modestly forceful rhythm section while Prewitt's voice carries the melody, with his guitar helping blaze the trail. A little noise from the guitar shakes things up and gives it a rock feel, while the strings and keyboards add a little tension so the song can fully realize its potential. "When I'm With You" blends the rock of the 70's with the glowing pop of the 60's, with a danceable, hook-laden pop song flaunts its stuff for your enjoyment. "Gifts of Love" is all jangle, bouncing around with its slippery hooks and slightly rough exterior. Then there is "Atmosphere", a soft, drippy song that slowly taps as Prewitt's voice comes to the head of the class, no rock guitars or lush mixes to hide behind. The soul exudes from each note as he pours his heart out. And "Sister Ice" is another example of Prewitt's pop sensibilities, as he delivers a slow, bouncy song that manages to rock without the rock, while background vocals echo the soul that hides in each of Prewitt's numbers. This is a solid, warming collection of tender pop songs that sharpen their blades on rock. I'll give it an A.